Long ago in the 1800s Park City had its humble beginning as a silver mining town during a boom that made 23 millionaires in the US. Park City grew into the early 1900s but the demand for silver declined and so did the population of the town. Park City rebounded during the 80s and 90s following the build of Park City Mountain Resort and has expanded into a tourist hot-spot bringing in around $530 million to the Utah Economy. The Historic District sits at the top of Main Street and spans 9 blocks. Conveniently accessible from I-80 and only 35 miles from Salt Lake City and SLC International Airport makes this once little ghost town a frequent destination for locals and out-of-state visitors. Forbes Traveler Magazine named Park City as one of the 20 ‘prettiest towns’ in the US in 2008. Many of the old miner’s homes and downtown stores are still in place after nearly a hundred years of use. In fact, Sixty-four buildings are listed on the National Register of Historic Places. In a historic town where buildings once housed boarding houses, saloons and a few ghosts here and there you can now find swanky boutiques, restaurants, and galleries. Rumor has it Park City has the most restaurants per capita. 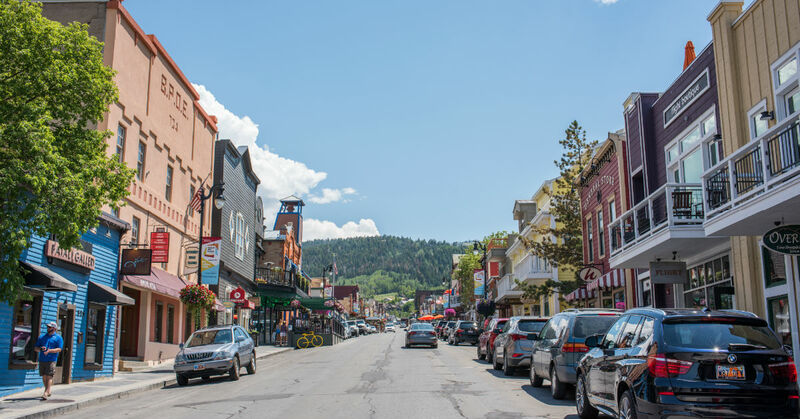 With over 70 venues to choose from locals know Park City’s main street as a premier dining destination. The decadent and diverse dining scene can be enjoyed after a day full of shopping and browsing through Main Street boutiques carrying goods ranging from ski gear to fine jewelry, bookstores, clothing, antiques and much more. With over 30 art galleries in Old Town, you can spend hours perusing featured art from world-renowned and local artists alike. Classic paintings from Picasso and locally crafted jewelry provides an inspiring stroll up Main Street enriching the city’s history with Park City’s specialty of art. Parking is a cinch with three free parking structures and plenty of on-street metered parking spots. Park City also provides free city-wide public transportation seven days a week between 10AM and 11PM with many routes connecting to the Old Town Transit Center conveniently getting you to the Historic District. Park City is a true four-season resort town with 8,300 residents and a outdoor paradise drawing thousands more every year to visit. Consider scenic Park City for your next real estate purchase and start living your Northern Utah ski-country dream!